Probably the best known ice cream cake is Baked Alaska, or as it is known in French the wonderfully named Norwegian Omelette. 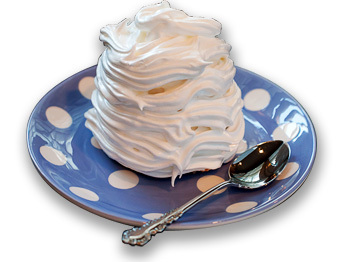 It is a dessert made of ice cream put in a dish lined with slices of sponge cake and topped with meringue. The entire dessert is then placed in an a very hot oven for just long enough to firm the meringue. The meringue cooked at this temperature stops the heat getting through to the ice cream so when served the ice cream is still cold inside. 1. Preheat the oven to 230°C. Put a 650ml vanilla ice cream brick on a ready-made sponge flan case and trim the sponge around it, leaving a 2cm border all round. 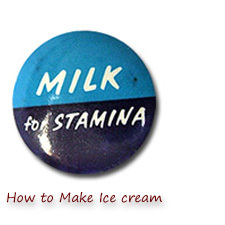 Remove the ice cream and return the ice cream to the freezer. 2. Sprinkle the sponge or sponges with 4 tbsp. Marsala, wrap in cling film and set aside while you make the meringue. 3. Whisk 4 medium egg whites until stiff, this is best done in a food blender but if you have strong arms the whisk by hand. until all the sugar has been added and you have a thick, glossy meringue. 5. Now assemble the Alaska: put the sponge or sponges on a baking tray lined with greaseproof paper. Put the ice cream on top of the sponge, then pile the meringue on top and over the sides, covering the cake and ice cream. Sprinkle with flaked almonds. 6. Bake for 3-4 minutes or until well browned. Dust with icing sugar and serve immediately. How to make ice cream cake. Ice cream cake can be made two ways either with layered ice cream or a mixture of ice cream cake and biscuits. An ice cream cake is made by blending blocks or slabs of ice cream together and using the softer ice cream for the icing. The result makes a cake made entirely of ice cream. The Victorians made desserts called Bombes, which consisted of ice cream and fruit in fancy molds. The Bombes were lined with cake or biscuits this was a forerunner to the ice cream cakes that are now available in the supermarkets. You will need a strong cook’s knife to cut the ice cream and preferably one with a serrated edge. Using homemade templates a variety of traditional cake shapes can be made. It is really a matter of using your creativity. For example: A plate makes a good circular cake template. It is best to cut the ice cream from frozen and replace it in the freezer as soon as the cutting is complete. Soft ice cream can be used a little runnier for the icing. This will re freeze properly when put back in the freezer. Fresh fruits, chocolate chip and nuts and candy can also be added.